US, 1960, 87 minutes, Black and white. Alan Ladd, Sidney Poitier, Ingmar Johansson, Glenn Corbett, James Darren, Mort Sahl. 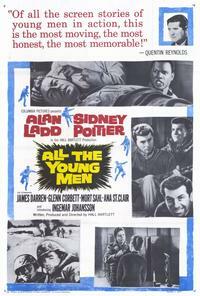 All the Young Men is very much a film of the late '50s-early '60s. it was written, produced and directed by Hall Bartlett, a writer-director who has had a spasmodic career for many decades e.g. Unchained in the '50s, Jonathan Livingston Seagull in the '70s, Comeback in the '80s. By and large, critics have not been favourable to his films. This film presents a conventional picture of the Korean war where it is of interest is its picture of the Marines, the farmhouse with the Eurasian woman and the family. There is a fair amount of action sequences. However, the focus of the film seems to be less on the actual war than on the racial war (perhaps each symbolising the other) between Sidney Poitier as Sergeant Towler, a black man in charge of the patrol at the farmhouse, and Kincaid, played by Alan Ladd. Needless to say, there is an assorted range of racial prejudice and sympathy within the particular troop. The focus of the action is the beating off the tank, Kincaid to have his leg amputated and Towler giving his blood. There is reconciliation. The war sequences and heroics can then go on. The touch of romance is always there, especially at the end. The film in outline echoes the much more substantial Stanley Kramer film, The Defiant Ones, where Tony Curtis and Sidney Poitier portray two prisoners chained to each other. This seemed, in the '50s, to be the definitive film about black and white relationships and Americans, both black and white, being chained to each other and then learning to relate. The film reflects the style of the times and audience response to Alan Ladd towards the end of his career and Sidney Poitier at the beginning of the '60s in which he was to receive an Oscar and portray outstanding characters in To Sir With Love, In the Heat of the Night, Guess Who's Coming to Dinner, A Patch of Blue etc. 1.The impact of the film in its time? Ten years after the Korean war? American marines? The issues of war? The issues of racism? 2.The Korean setting, the snow, the emphasis on the difficulty in the wintry snow? The house? The battle and action sequences? The musical score? The use of ‘When the Saints Go Marching In’? 3.The title, the reference to the group? Their mission? 4.The Korean war situation, the battles, the Chinese enemy? The Koreans and their houses? The billeting of the men in the Korean house? The woman, the injured members of the family? Her support? The background of violence, sexual abuse? 5.The focus on the group, all the young men? The credits and the emphasis on the actors, their characters? Each of the characters with a personality? In the snow, loyalties to Kincaid, questioning of Towers? Through the snow, the strategies, the mine? Kincaid and his guiding the young man? The suicide mission, the lookout for the Americans? Waiting for the Chinese? Their finding the house? Settling in? 6.The importance of dialogue in the film, especially with the race issues, and American attitudes at the time? The 1960s and the changes? The variety of characters, the Swedish immigrant and his perspective, the medic and his help, the Navajo Indian – and his death? The men talking together, memories, stories? 7.Alan Ladd as Kincaid, older, experienced, the letter and the book? Support of Towers? His being on the lookout, guiding the young men with the mission with the mine? The interactions with Towers, their stances? Collaboration at the end? 8.Towers, Sidney Poitier, his being an icon? The irony of the black man being put in charge? His own attitudes towards race, the racist taunts? His pulling the rifle? His going aside to reflect, the Buddhist overtones in the house, his discussions with the various men? His sense of duty, responsibility? His overall view, counteracting the arguments of the men? 9.The final action, the heroism? 10.The importance of the war themes in these times? the importance of the race issues – especially with Sidney Poitier in the tradition of The Defiant Ones and the films he was to make in the 1960s?